Pt Mollie: To run or not to run? That is the question. I wrote this post in the week leading up to NYC Marathon. It gives a good insight into the worries runners have when training no longer takes up most of their time. Since coming back from the Wadi Rum Ultra, my right ankle hasn’t felt right. The range of motion (ROM) was decreased and something inside the joint felt locked and stiff. Many other parts of my body hurt too so I didn’t pay too much attention for the first few days I was back in the UK. Over time, the other aches went away and the blisters on my feet healed (no toe nails have dropped off yet). But my ankle was still off. I knew only having three weeks between these two big races was a risk. Running across all of the unstable sand made my ankles work harder than usual. My biggest fear is that if I run the NYC Marathon on 4 November, I will do long-term or permanent damage to my ankle. This winter, the plan was to cut back on the miles a bit and spend more time strength training. However, I also wanted to get back to Track Tuesdays with Advent Running. I haven’t been in two months and I miss seeing everyone and working hard. Hopefully my performance will not have suffered by the time I make it back. Luckily for me, osteopath consultations are covered under my Simplyhealth active plan. The team at Function360 have a few osteopaths on site, so I booked in for an hour long appointment with Victor. He had seen me prior to Wadi RUm Ultra for a pain I had in my neck (another case of maranoia). As we already had a rapport and he knew a bit about my 4x4 Challenge, I felt safe in his hands. I also know that the Function360 team supports their clients’ goals. If I said I definitely wanted to run NYC Marathon, Victor would make it happen. We began with a chat about what the pain was, where it was, and how it felt. He then observed me moving a few different ways (on my toes, on my heels, bending knees, etc) to see how my ROM and flexibility was on my right vs left side. He then had me sit on the table and palpated my feet, ankles and calves. By observing what points were painful for me and how ankles and feet felt under his touch, his detective work continued. He determined I had a strain and possibly sprain on the inside of my right ankle. As treatment, he spent some time massaging around my medial mallelous, and also on my calves (sometimes tight calves can cause pain in the feet) to help relieve the pain. Victor moved my right leg and foot around to encourage lymph drainage and inserted about five acupuncture needles in my ankle to help address the pain. The last step of my treatment was taping the inside of my right leg from my ankle to mid-calf with a single piece of kinesiology tape. I had always thought taping was a placebo affect, but Victor told me that this study showed that kinesology tape helped promote lymphatic drainage. The tape stayed in place for three days. Victor recommended active recovery that was low impact, such as swimming or cycling. He also wanted me to do some ankle strengthening exercises to help loosen the joint and promote strength. I only went swimming once, combining walking the water with a doggie paddle as I didn’t want to get my hair wet (but it did anyways). I also did a yoga class, some slow dog walks, taught indoor cycling once, and lead a beginner’s 5K before work one day at a 10 min/mile pace. A week after my initial visit, my ankle ROM had improved but it still wasn’t feeling 100%. I booked a 30 minute appointment to follow up with Victor. We chatted briefly about what I had been doing to recovery since we last met and how the ankle was feeling. He again observed me walking and stretching in various ways before manipulating my foot and ankle to find the source of the pain. Using massage wax, he used manual therapy on the tenderest areas. He also performed some traction on my ankles. At this point I was really torn. Victor confirmed there was still a strain (ligaments) and/or sprain (tendon) in my right ankle. The process takes 21 days to heal so I technically would have enough time to be ready for the NYC Marathon. On the other hand, working too hard during the race (like for a PB) so soon after injury could make the complete recovery process take longer. Victor said the decision was up to me as there was a chance I would be better. Again, he recommended low impact activities and that I invest in an ankle brace if I was going to run the marathon for additional support. My ankle feel fine running unless it moves left and right, which might happen during the race as I avoid water bottles and other runners on the road. 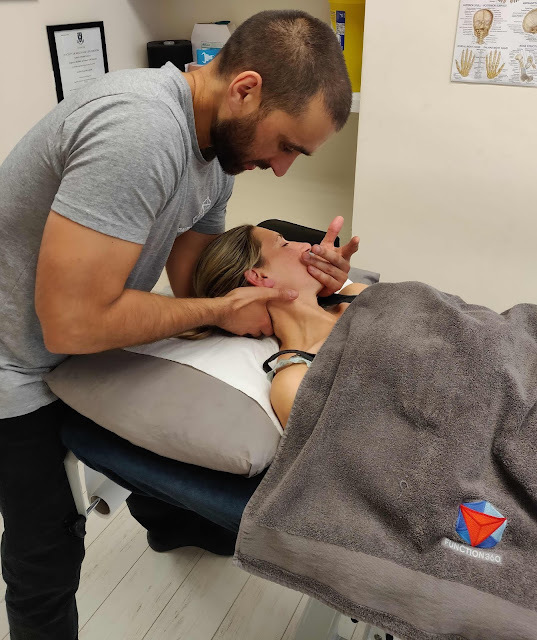 Luckily, I know I have medical care available if I do decide to run as my active plan runs for a full year and covers physiotherapy, osteopathy, acupuncture, and more. There is a chance my travel insurance will reimburse my trip after receiving a letter from Victor, who is a member of the General Osteopathic Council, explaining I am not fit to travel. I have been doing some soul searching to decide what I should do. This trip is a package deal with a tour company, so I won’t get a refund from them, not would I be eligible to defer my place to next year. I am working hard to complete all of the World Marathon Majors but my Chicago race last year was a horrible time due to injuries. I wanted NYC to be a PB. Update #1: I was able to run the entire NYC Marathon. A full review of the race is forthcoming here on the blog. Luckily, my ankle didn't bother me at all. Instead, I ended up stopping to use the loo five times. It wasn't a PB race but not my worst either. I am back to light running this week and look forward to getting that PB in 2019. Update #2: After teaching spin class Monday night, going to track Tuesday, and then leading a run club Wednesday morning, my ankle was a bit tender to the touch. I was able to book an appointment last night with Victor who said I need a longer break from running. He also taped my ankle and gave me isometric exercises to do. Someone please hold me accountable on these as I am eager to run again! Have you ever been in a similar situation? What did you do? Leave a comment below and let me know. Thanks to Simplyhealth for sponsoring my 4x4 Challenge. NYC Marathon is the last race in the set.